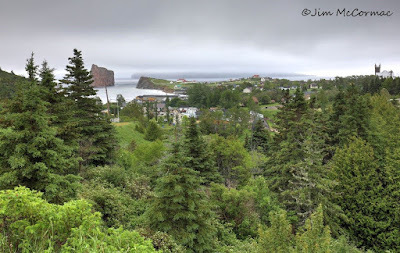 The village of Percé, on Québec's Gaspé Peninsula, as seen from the mountains above town. The large rock monolith arising from the Gulf of St. Lawrence, just right of the largest spruce tree, is Percé Rock. Laying low on the horizon, shrouded in fog, is Bonaventure Island. Tens of thousands of seabirds nest on these massive rocks, most notably enormous numbers of northern gannets. To get to Bonaventure Island, one takes a boat that leaves on multiple times each day from the main pier in Percé. It isn't a long ride, but you'll see scores of birds, a number of seals (harbor and gray), and possibly minke whales. The birds steal the show, though. Fast-flying squadrons of alcids constantly rocket past: razorbills, common murres, and black guillemots. Get lucky and you might see one of the few Atlantic puffins that breeds on Bonaventure. Scads of black-legged kittiwakes waft by, and occasionally flocks of large chunky common eiders pass by low over the waves. Huge great black-backed gulls float about, mixed with herring gulls. But most of the tourists are here for one thing: northern gannets. These huge seabirds (6 foot wingspan! 7 lbs!) can't be missed. You'll see lots from the pier while awaiting the boat. And somewhere on the cruise to the island, a feeding swarm will likely be encountered. 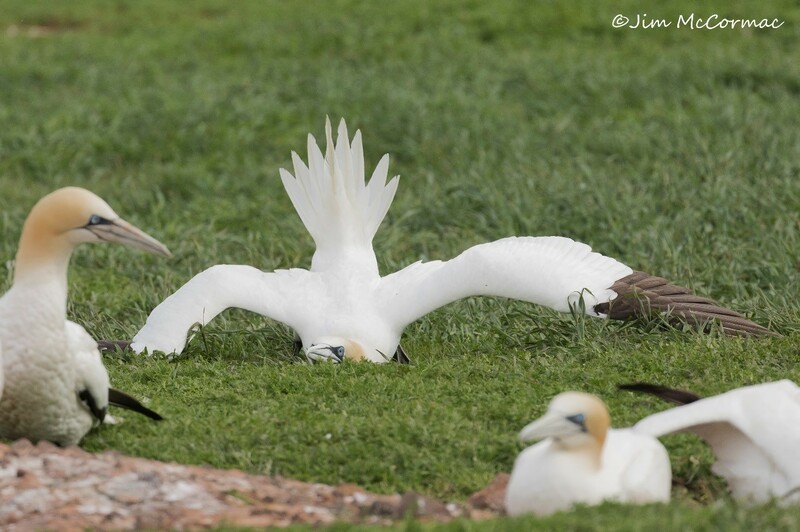 When gannets locate a school of fish near the surface, the frenzy commences. Gannets are plunge-divers, dropping from the heights like air to water torpedoes, and entering the drink with great splashes. At times, many birds are literally bombing the ocean like feathered kamikazes. As interesting as all this is, visitors have yet to see anything, gannet-wise. The photos in this post were made on July 1 - one of two trips that I made to Bonaventure Island. I saw so many interesting plants and other things on the island, but spent nearly all available time with the gannets on the inaugural trip, that I had to go back. In addition to Bonaventure Island, there is much to see in this part of Québec. The Gulf of St. Lawrence is home to many whales - mostly humpbacks and minkes at this season - and they're easy to see from land. Seals can be spotted hauled out on rocks anywhere. Birds galore. Stunning scenery at every turn and angle. And interesting culture. The Gaspé is France in North America. French is the first language, although most natives know enough English to communicate with Englishmen such as myself. I hope to get back here soon, and Debbie DiCarlo (my partner in photo workshops) and I are plotting ways to run a trip up here, maybe next year. 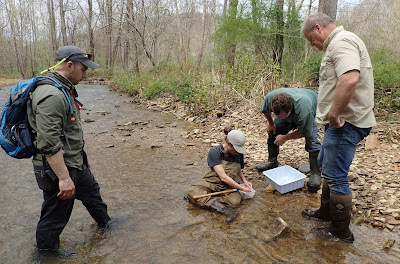 HERE IS a link to our current schedule, with reports from previous workshops. If you would like to be added to our email newsletter list, send Debbie an email - her contact info is RIGHT HERE. If we do the Gaspé trip, it'll be a hyper-productive one, to a place few Americans apparently visit. I saw probably less than a dozen license plates from the States my entire time up there, and met no other Americans while out and about. And I was out and about a lot. Anyway, after exiting the boat on Bonaventure Island, guests are welcomed by staff of the National Park Service, and given an informative briefing on the island. After paying a small fee ($8.50) it's off to the trails. While there are miles of trails on the island, most people take the direct overland route - about 1/2 mile one way - to the gannet colony on the far side of the island. The walk is interesting, mostly through spruce woods populated with many breeding songbirds. 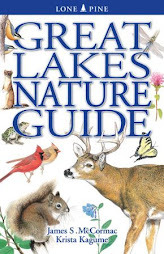 Fox sparrows, yellow-bellied flycatchers, and many species of warblers can be found. If you're lucky, maybe even a boreal chickadee. But the highlight is yet to come. Before even exiting the woods, you'll hear a strange racket ahead which increases as you move forward. Then comes the smell. And moments later, one pops out into an opening near the island's sea cliffs, and there they are! Scores of nesting gannets, seemingly arranged geometrically. 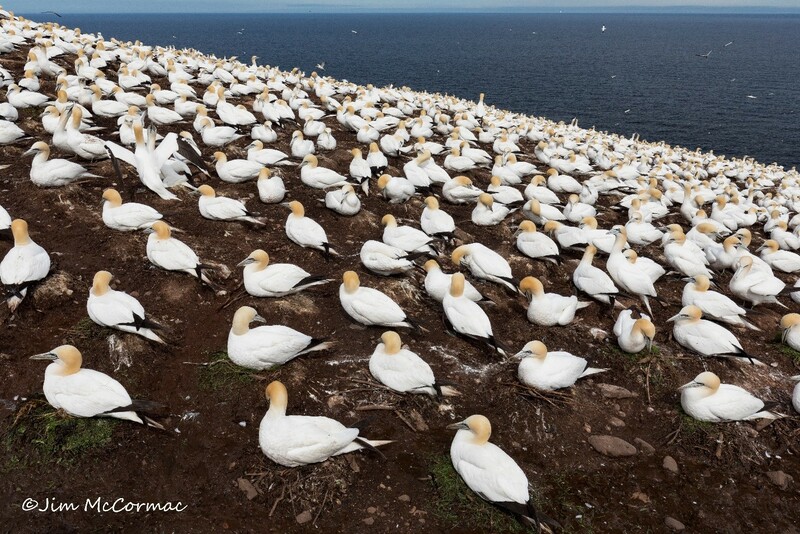 Over 50,000 nesting pairs are present, and the sight of this many birds in such close proximity is breathtaking. Your senses of sight, smell, and hearing are nearly overpowered. There is a carefully managed viewing area at this spot - a grassy opening hemmed in by a simple rope fence. There is even a concession stand! The gannets could care less about our presence, and the closest nests are within a few feet of the fence. On several occasions, I was startled by gannets who had snuck under the fence to our side, and stood there curiously regarding me from feet away. At one point, I took a short trail through the woods to another viewing spot, and who should come marching down the trail headed my way? A gannet, in the woods! He and I had a brief Mexican standoff, I moved to the side of the path, and he sidled by two feet away. All of this should make for simple photography, one would think, but such is not necessarily the case. 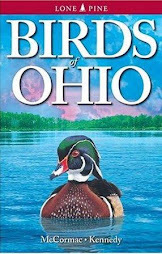 So many birds are in such close proximity that isolating individuals can be tough, and one must be vigilant about exposing the snowy-white birds correctly. It is easy to overexpose them. 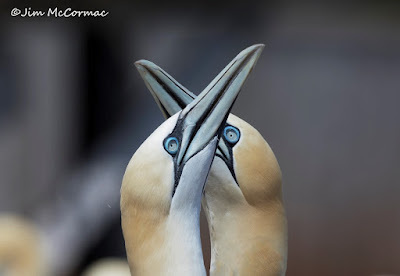 Nonetheless, I learned a ton about how to approach Bonaventure Island gannet photography during my six hours spent with the birds on this visit. 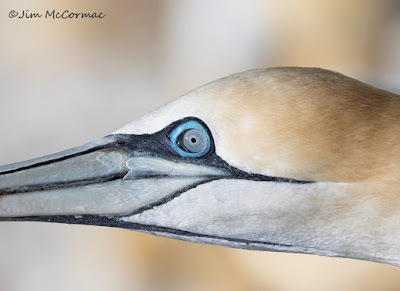 Gannet, in portraiture. Large lenses are really not essential here, although I lugged my tripod and Canon 500mm f/4 II along on Trip #1. And am glad that I did. That big lens focuses down to 7.5 feet and allowed me to make sharp "macro" images such as above, especially when rigged with a 12mm extension tube. It also does a superb job of creating bokeh; melting the background away. Those are all gannets in the backdrop of this photo, and they aren't very far away from my subject. A 16-35mm wide-angle lens covered other bases, and those may have been the only lenses I used. Any sort of wide-angle, and larger zoom lens should cover you here. Even a good iPhone will produce rafts of great images! One of the myriad reasons that kept me at the colony all day - I was on the first boat at 9 am, and departed on the last, at 5 pm) was the fascinating behavior of the gannets. Here, a pair engages in "mutual fencing", a display in which the male and female stand breast to breast and rapidly waggle their bills back and forth, clacking them together in the process. This is one way that birds reestablish pair bonds upon uniting at the nest site after a long winter at sea. 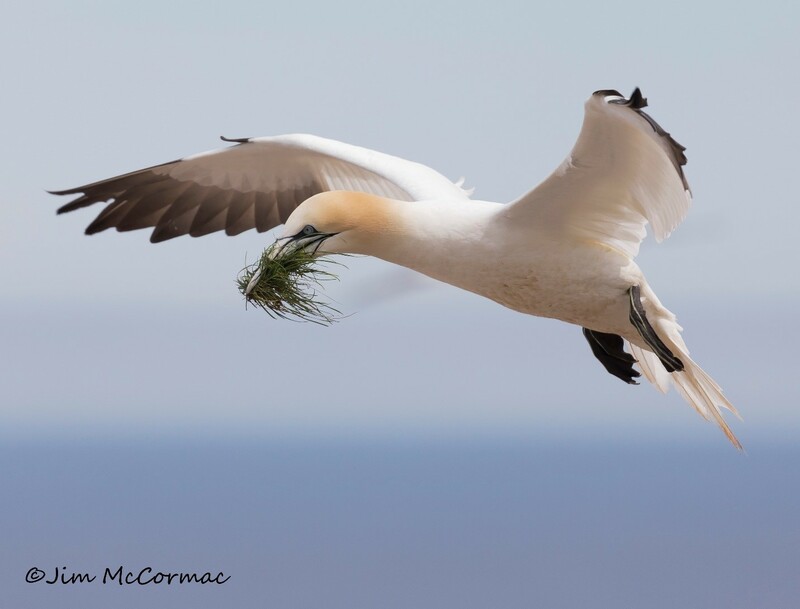 Gannets were frequently returning from the Gulf with beakfuls of "seaweed", various kelp, I imagine. 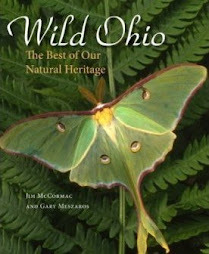 They use it for the simple nest, and in a ritualized greeting in which the harvester presents his mate with the gift. While graceful - supremely so! on the wing, the same cannot be said of land-bound gannets. Things start to get a bit dicey when one of the massive boobies nears the ground and preps for a landing. The birds in the immediate vicinity seem to get a bit edgy, perhaps wondering if they'll get mowed down if things go south with their comrade's landing. Here's a bird crashing and burning upon entry to terra firma. But not for long - he jumped right back to his feet and set off to locate his own nest, which is quite a feat in and of itself. A just alit gannet, bearing a gift of plants, stands in seeming confusion. He was using whatever cues it is that gannets use to ferret out his nest among the mob. I noticed that it doesn't take them long to find the nest, even though a returning bird may have landed 20 or more feet away. Getting there is the challenge. 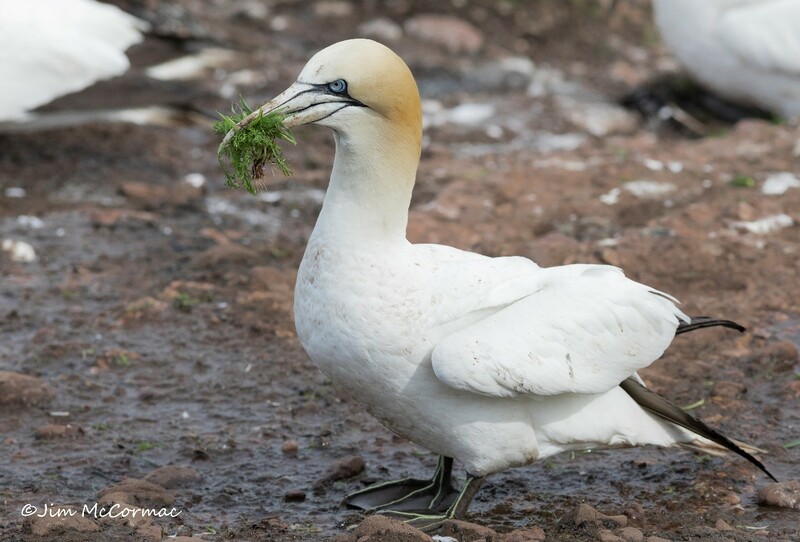 The nests are tightly spaced and nesting gannets DO NOT like interlopers passing through their turf. The returnee faces a gauntlet of clacking swordlike bills and mewls of protest as it stumble-runs through the mob. Once back in its tiny space, all is well and peaceful again. This is the end game of all this chaos. Baby gannets! Here's a few day old chick peeking from under the 7 lb. safety blanket of an adult. The little ones are carefully tended by their parents, and regularly fed regurgitated fishy slop. In fact, moments before I took this photo, the adult released a load of nasty-looking gruel nearly on top of the little guy, who immediately proceeded to lap it up. 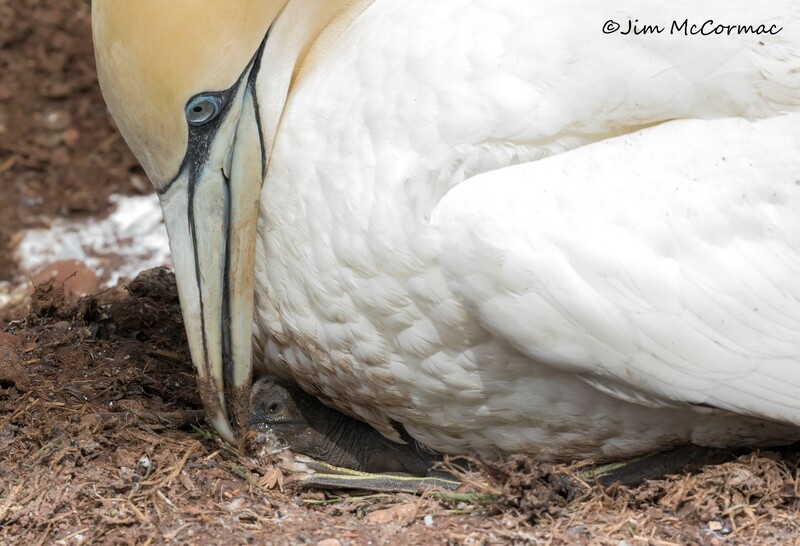 Gannets have but one chick, and if all goes well for the little fellow in this image, it'll waddle to the nearby sea cliffs in about 12 weeks, and jump/flap/glide into the sea. Still without fully developed wing muscles, the juvenile embarks on an incredible journey. Fully independent from the adults at this point, the young gannet begins swimming - SWIMMING! - out to sea. For some unknown period of time, until it develops the power of flight, the juveniles can only disperse by swimming. Chicks making it to adulthood can live a long time. 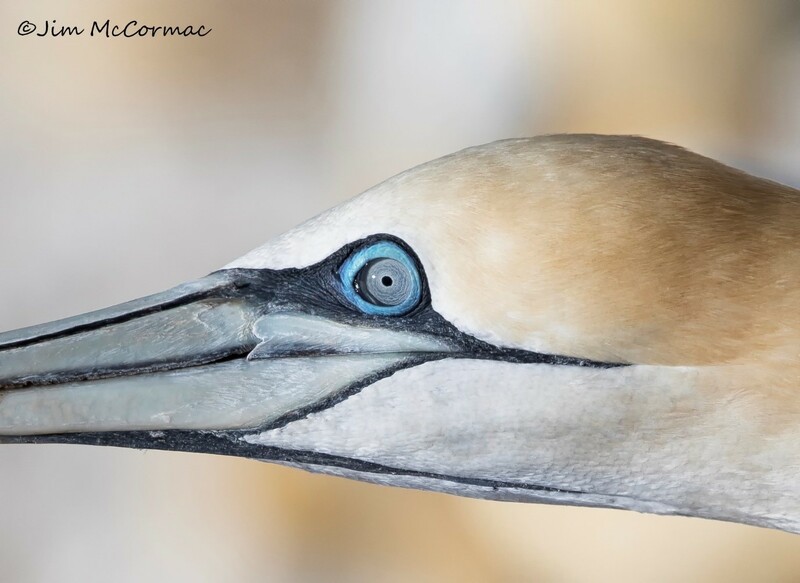 The oldest known gannet was about 21 years of age. There are only six gannet colonies in North America - three in the Gulf of St. Lawrence, and three off the coast of Newfoundland in the North Atlantic. Fortunately they're doing well, with steady population increases at all colonies in recent decades. Hopefully that's a trend that will continue.